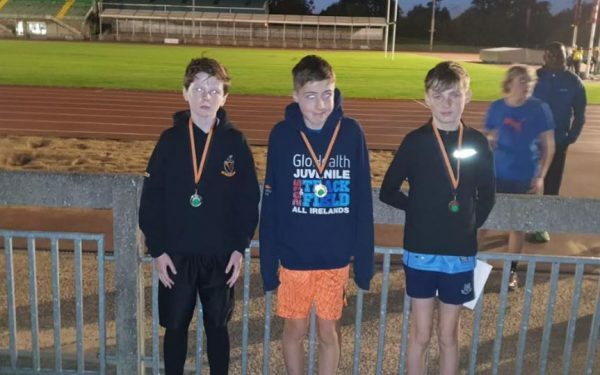 Eugenia Bateson Reports: On a humid blustery night our juvenile athletes competed in the Club Cross Country Championships in Santry Demesne. 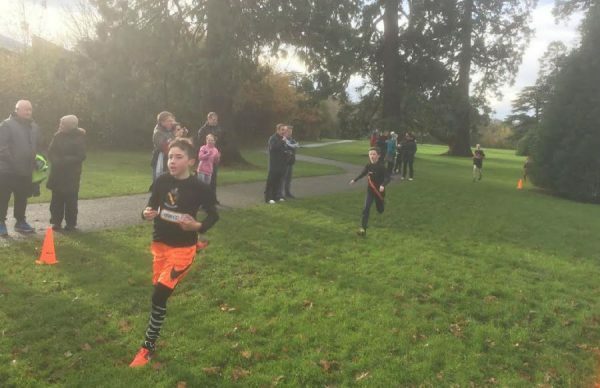 Over 90 athletes put in fine performance running a challenging course covering part of the National Championship course along The Walled Garden, or more affectionately known as “Gerry’s Loop”. The U10 Girls set a high standard followed by the U10 Boys. Numbers were high in all AGE categories. The U13/14 Girls followed by the U13/14 Boys brought the championships to a close as darkness fell as the last athletes crossed the line. Club 10,000: Power Skips the Light Fandango! Under lights at Morton Stadium last night Declan Power led the field on a merry dance in the Club 10,000 Championship for the Bonass Trophy. the Championship was incorporated into the latest round of the Grand Prix Series and drew a bumper field of some 50 starters, undoubtedly the largest 10,000 track championship in the country. Although Declan refrained from “turning cartwheels across the floor”, he certainly left the opposition feeling “kinda seasick” and looking a “Whiter shade of Pale”! Chased hard in the early laps by Sean Doran and Tom Sherlock, in the end Declan powered away to win and be crowned the Club 10,000 champion 2018 (possibly his third or fourth win in this event?) in a fast 33:47. Tom Sherlock was runner up with Sean Doran 3rd. Declan won the Bonass Trophy, sponsored by Pat Bonass. 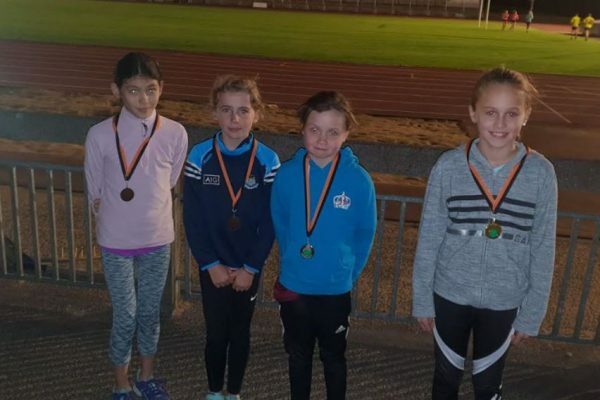 It was also pleasing to see such a great turnout of women athletes for the Women’s Championship and the first ever Women’s Cup, again sponsored by Pat Bonass which was own by Maura Matthews in a time of 40.58 from Emma Dunne, the 2017 Grand Prix Champion and Aideen Brady 3rd. In the Grand Prix handicap, 1st place was taken by Murray Ahern from Sinead Smith and Joe Cole 3rd. 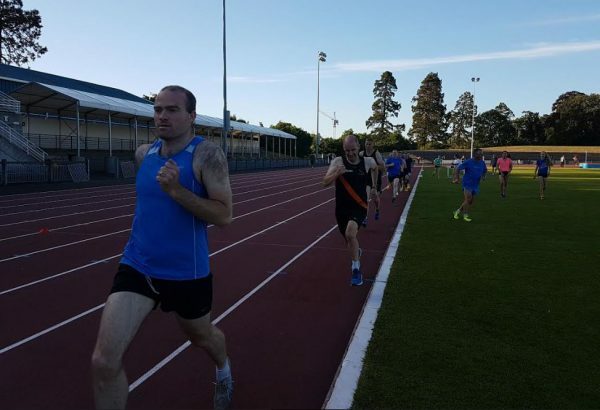 A big thank you to the officials who kept tight tabs on affairs and succeeded in keeping athletes firmly on track for the 25 laps of Santry and a big thank you also to sponsor, Pat Bonass. The Committee of Clonliffe Harriers are extremely grateful and obliged to Pat Bonass who has most generously sponsored a new trophy for the Women’s Club 10,000 Championship. Pat of course already sponsors the Men’s 10,000 championship and over 30 years ago presented the Bonass Trophy to the club for presentation to the Men’s 10,000 champion. Both Men’s and Women’s Championships take place on Thursday September 13th in conjunction with the Grand Prix Series round that night. The club championship are open to all members of Clonliffe Harriers. With the Dublin City Marathon taking place approximately six weeks later the 10,000 Championship represents an ideal opportunity for men and women’s athletes to get a good 10,000 race or indeed tempo under their belts. Whilst the thoughts of 25 laps on the track may be a little daunting to some it is important to bear in mind that 10,000 on the track is still the same distance as a 10k road race but there are no hills on the track in Morton Stadium! All are encouraged, men and women to include this race in their schedule. See you on September 13th. 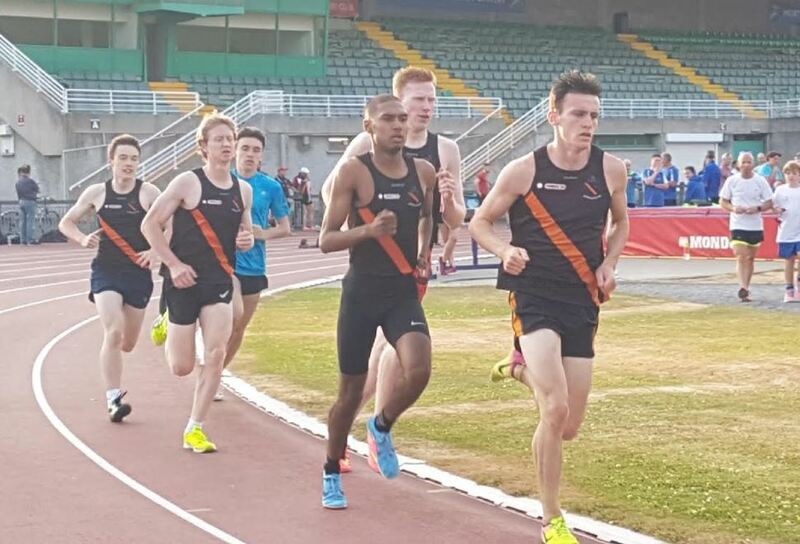 Grand Prix Series – Round 11 – 5000metres / Incorporating the Club Championship 5000metres – Morton Stadium – Thurs, July 26th – 8pm. The evening proved perfect for distance track running – 24 Degrees, Humidity 52 Degrees with a light breeze. We had 55 runners, split in to two seperate races. Many thanks to Declan Murray for his kind sponsorship of the Grand Prix Race. Many thanks to everyone who helped make this race such a success. 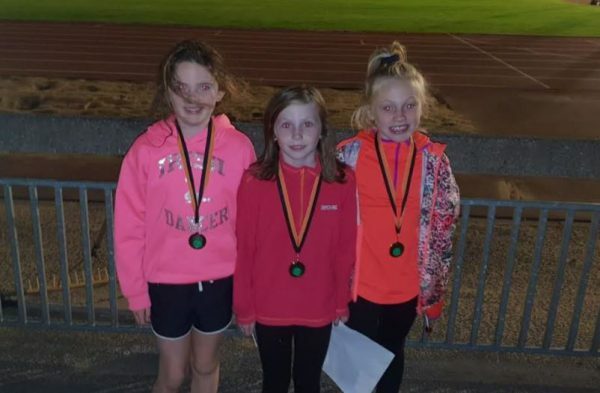 The latest round of the grand Prix included the Cloniffe Club 1500 Championships in Morton Stadium tonight. 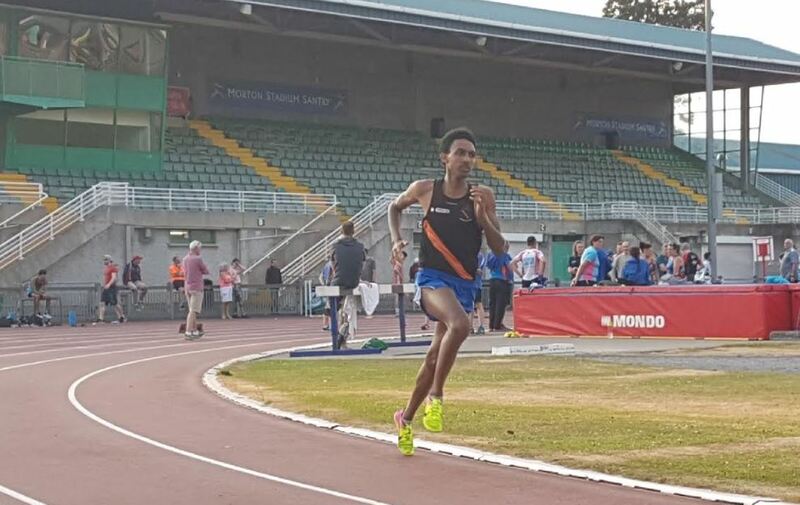 No need to say it, but will anyway, it was the usual warm dry evening in Santry! Again with the number of athletes running some 4 races were required. 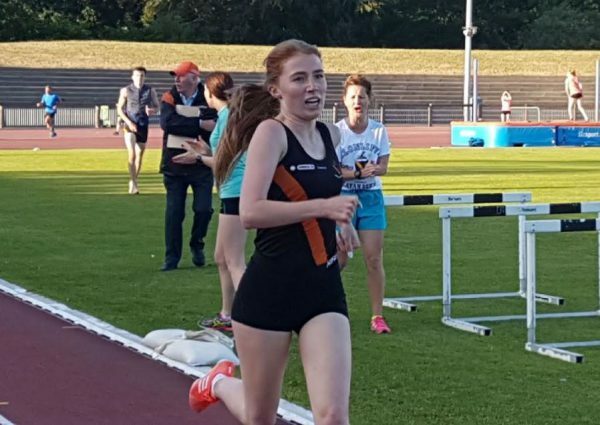 The women`s club champion came from race 3 Alannah Cooley, making it a middle distance double having won the 800 2 weeks ago, running a time of 4.57. 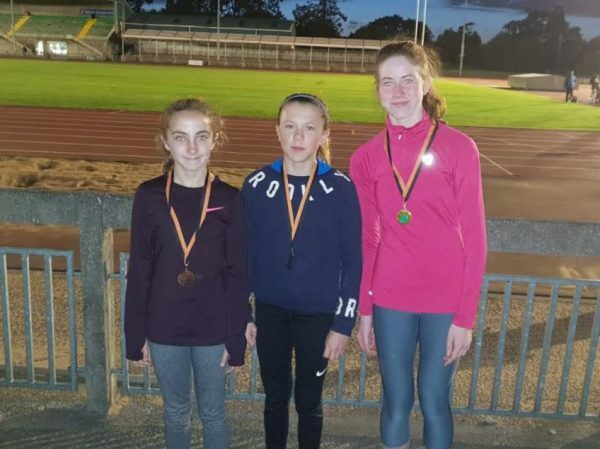 2nd and 3rd had come from the previous race as Aoife Hession 2nd (5.13) held off Aisling Andrews 3rd (5.14) who had just managed to relegate Alan Fitzsimons to 4th. 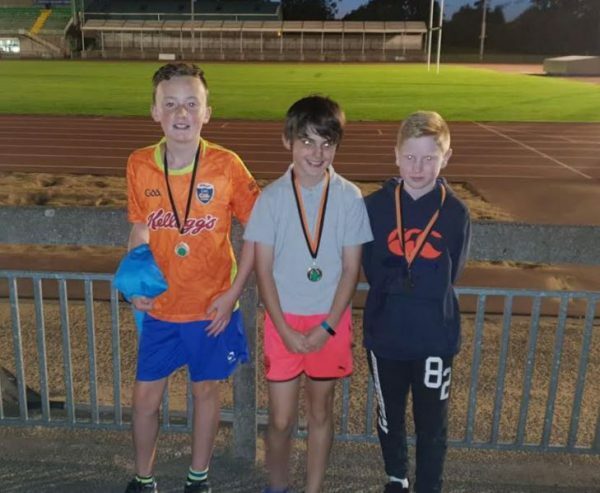 The final race of the evening was the men`s championship where Efrem Gidey tore the field apart with a 58 second opening lap, and then eased off to win in 4.05, with Craig Giles 2nd 4.08 and Greg Hossenny 3rd 4.09. 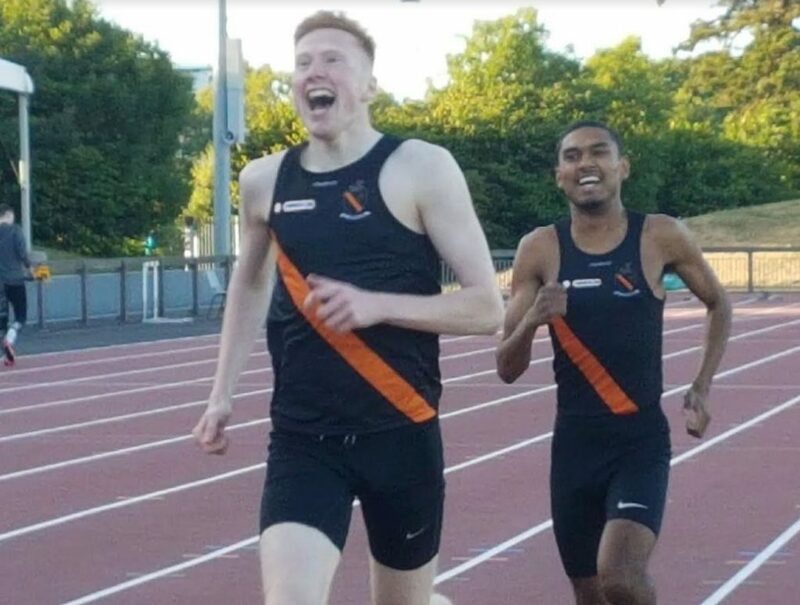 Sub 2 wins club 800, while in Grand Prix it`s Sheehy! 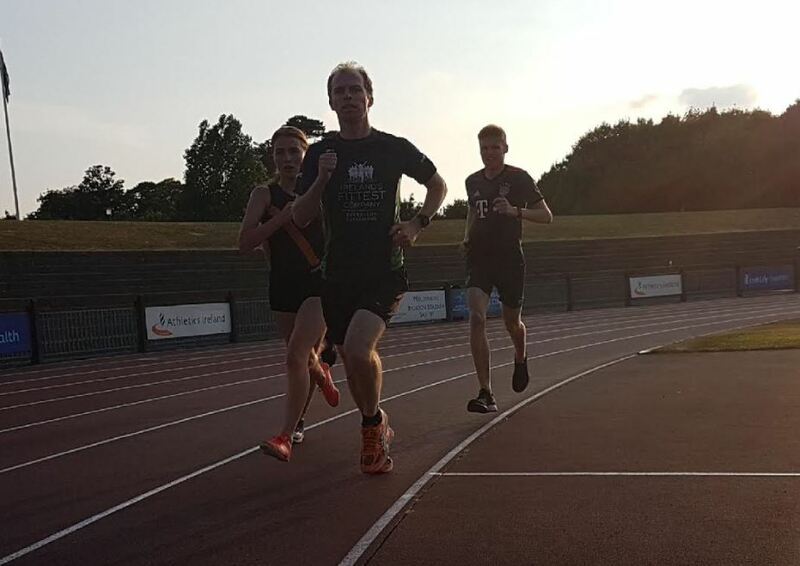 Another fantastic turnout on another great Summer`s night in Santry, saw some 5 races in all over the two lapper. 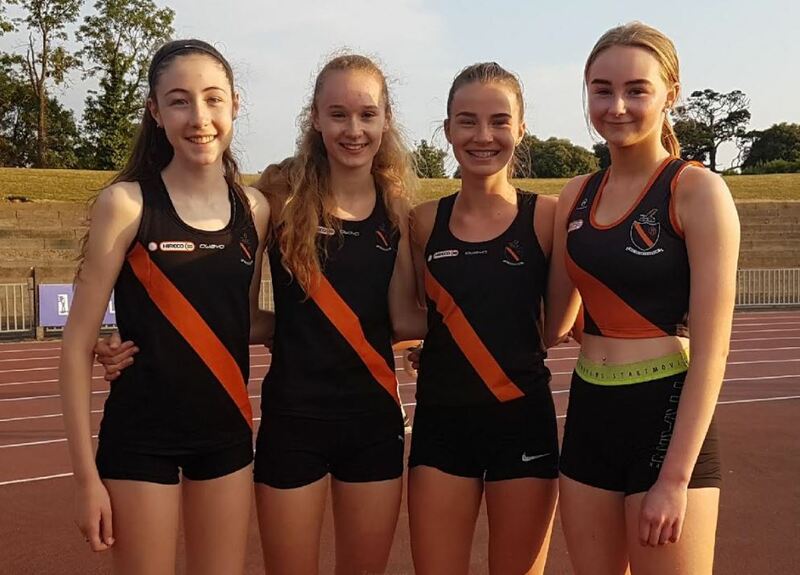 It must be commented that the number of young Clonliffe athletes proudly wearing their club colours was a sight to warm the heart. Race1 naturally produced the 2018 club champion as the eager young guns blasted off from the start, a 61 second opening lap saw Adam O`Brien run negative splits to duck under the two minute mark recording a time of 1.59.35 (TBC), followed by Sean O`Leary and the “Mauritian Express” Greg Hossenny , neither of these two seemed particularly distressed at not taking the win (see photo below!). 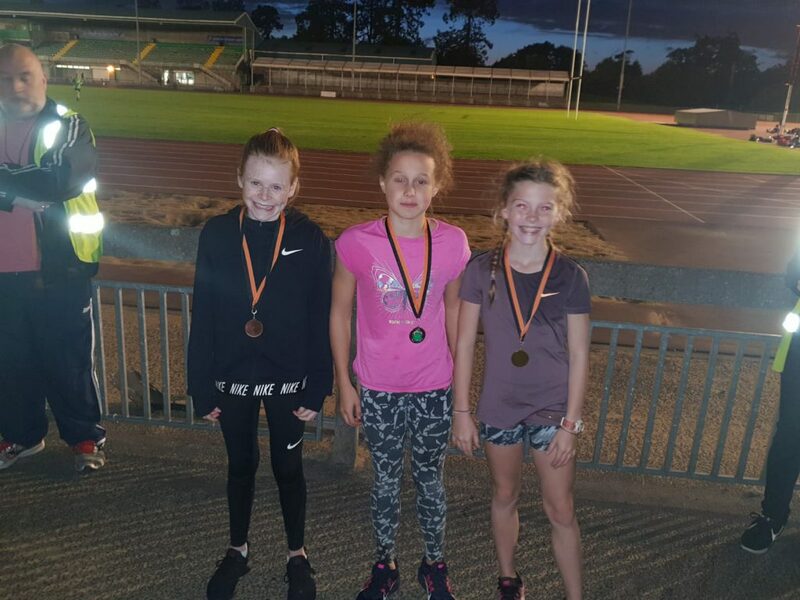 The women`s champion was young Alannah Cooley in 2.23.21 from race 2 and from race 3, the even younger Aoife Hession 2nd and Ella Brown 3rd. The Grand Prix winner was presented with the Cup by sponsor Richie Barr to a great cheer from the assembled masses and of course Kevin Sheehy being the shy retiring type he is milked the applause for all it was worth! Full result and report soon. 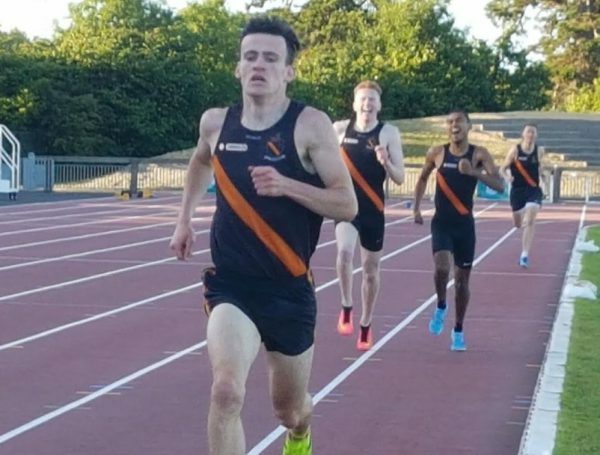 Next Thursday`s (June 21st) Grand Prix Round, the 800 (sponsored by Richie Barr) also incorporates the Club 800m Championships for both men and women. This being a club Championship the race is of course open to all club members. The races, there are expected to be several, will start at 8.00pm. Today was, as Sky Sports would say, Championship Saturday. 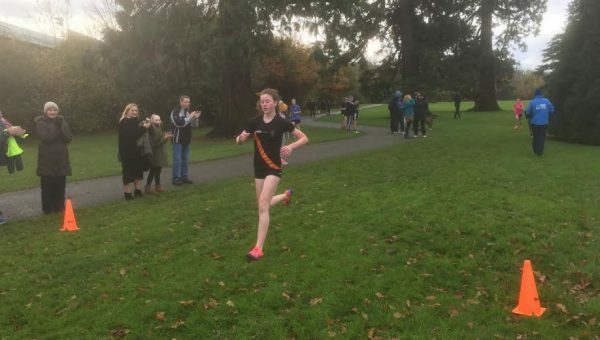 The Clonliffe Club Cross country for both Juveniles and seniors. There was a great turn out for the Juvenile Championships in the U/9 to U/15 age groups of athletes and parents. It was particularly good to see so many parents lined up on the finishing straight cheering on the youngsters. The ground was a little muddy in places after persistent overnight rain, but that`s Cross Country! 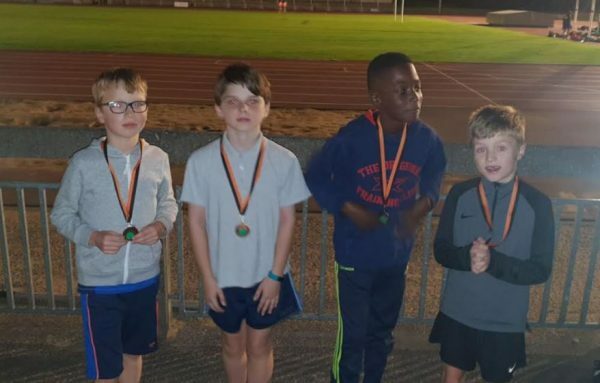 The young athletes as always performed with great enthusiasm and there were brilliant battles for honours all the way to the line. 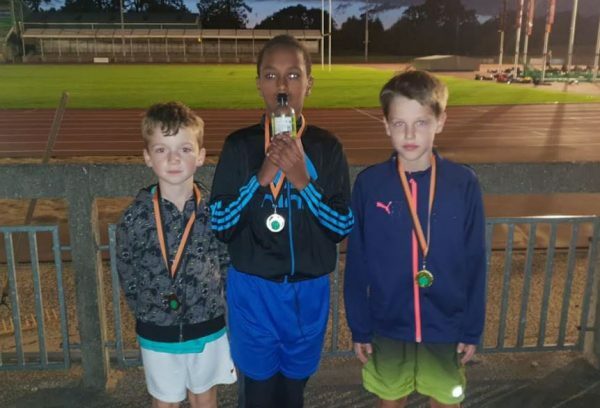 Here, (thanks to Ulrik for results and photos) are the U9-U15 results from today’s club XC championships. Also the senior championships took place as part of the Irwin Cup in the 2017 Grand Prix Series. The race was run over 6,000m and attracted another sizeable entry for this historic race. As there is a dispute on the results, they will be posted in due course. The 2017 Club Cross Country Championships take place this Saturday November 11th in Santry Demesne in conjunction with the penultimate round of the 2017 Grand Prix Series, the Irwin Cup. Proceedings on Saturday will get underway at 11 a.m. sharp with the first of the Clonliffe Juvenile 2017 Cross Country Championship races. Juvenile athletes are reminded to meet at the clubhouse at 10.15 a.m.
At 12 noon the Irwin Cup/Club Cross Country takes place, this year’s Irwin Cup is sponsored by George Maybury. The Irwin Cup is one of the club’s historic races with a history going back to 1932. The race itself, however, goes right back to 1910 when the club introduced a six mile cross country handicap race which included jumps and ditches and this became known as ‘the Grand National’. In 1932 the race was renamed the Irwin Cup in memory of Bertie Irwin. Bertie Irwin was a Clonliffe Olympian, he ran for Great Britain in the 1920 Olympic Games held in Antwerp where he qualified for the final of the 5000 finishing in 12th position. Bertie Irwin also won the National Cross Country. He served in the RNAS (later to become the RAF) in the First World War. Later he became captain of the R101 Airship. On a test flight in 1930 he recalled in a letter to the then Clonliffe club captain Tommy Burton that the airship had ‘flown over the Finglas fields where I enjoyed so many memorable runs with the Clonliffes’. Tragically, however, on the R101’s maiden voyage to India it crashed in Northern France on the 5th of October, 1930 killing 48 of the 54 on board including unfortunately Bertie Irwin. Saturday’s Grand Prix race, the Irwin Cup, will also double as the club Senior Cross Country Championship Race. 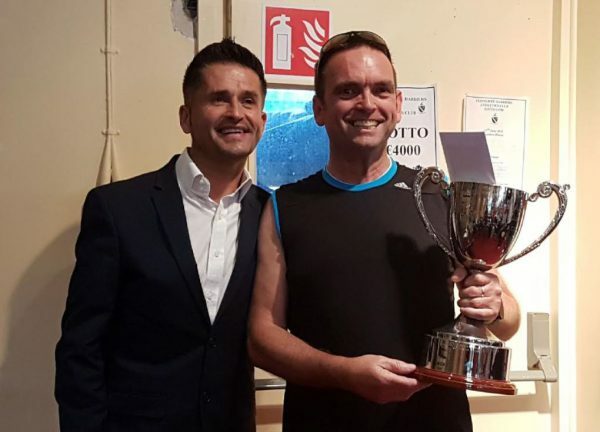 The race will be held over 6k, the winner of the men`s championship will be presented with the Harry Cooney Cup and the lady`s champion the, newly presented, Fred Connolly trophy. Thomas Sherlock was showing no after effects from his 16.27 5k sortie around Dublin`s Docklands in the Grant Thornton race 24 hours earlier (15th place) in last night`s club 10,000. On a blustery night in Morton Stadium he was the best of the 50 starters to win in 34.23 to win the Bonass Trophy with Sean Doran 2nd and Paul O`Loughlin 3rd. in the women`s championships Emma Dunne was best in 41.04 from Laura Kernan 2nd. There was some confusion on 3rd place and the officials are currently looking into this. The race was also round 12 of the Grand Prix Series, full results soon from Liam Hennessy.